Settling down on either side of the Atlantic, the interview with Nikki Dimage and Shawn Pelata, members of the North Carolina based melodic rock band ‘Line Of Fire’ (LOF) gets underway. Their second album ‘Momentum’ released in August 2010 has met with rave reviews and all manner of plaudits so who are they and what makes this band tick? Let’s find out…. For those unfamiliar with Line Of Fire, how would you describe your brand of music? 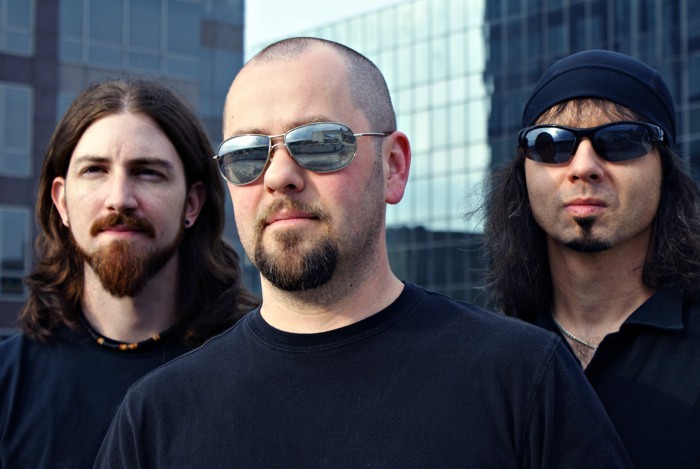 Shawn: LOF plays melodic rock music, plain and simple. From my own perspective, we naturally draw from our influences. Bands like Boston, Journey, TNT, and Def Leppard are some of our favourites and I think you can hear it in our sound. I don’t think we’re a throwback or retro band, necessarily, but we have our roots. If you like Melodic Rock, give LOF a shot because we think you will find something to like. Nikki: I would describe it as melodic hard rock. We do often hear the term “AOR” used and that’s fine with us but LOF is also influenced by bands that cross over between AOR and metal. Who have been your musical influences and in what way? Nikki: LOF has often been referred to as a “heavier” Journey and that is certainly a big compliment as Journey is definitely a huge influence. However, LOF uses really crunching guitar tones like bands such as Pretty Maids and Pink Cream 69. Shawn also likes to hit those metal high notes as well. I like to say that lyrically, LOF is an AOR band but sonically we are a hard rock band. Shawn: When I was in high school, twenty plus years ago, it was Geoff Tate and Michael Sweet that made me want to be a singer. Those two guys just blew me away with their power and ranges. The first bands I was in were more metal oriented, so the Tate/Sweet high note screams became part of my repertoire. I got into Journey before that, so Steve Perry has always been there. To this day, he’s a huge influence on me in terms of trying to make everything as melodic as I can. Nikki and I had a little joke in the studio, “What would Perry do?” Later on, I discovered John Elefante and I think he’s just amazing. I love the way he stacks harmonies and changes them up as the song goes on, adding new layers and separation. Plus, “Fight Fire With Fire” is still one of the best songs ever! Can you remember the defining moment when you decided you wanted to pursue a career in music? Nikki: For me, that defining moment came in 1974 when I first saw KISS on TV. Shawn: In all honesty, I sort of tripped and fell into being a singer. In high school, like I said, I had those dreams wanting to be like Geoff Tate or Michael Sweet and have a voice like that. But in terms of actually getting into playing in bands, it was completely accidental. I was at a friend’s band rehearsal in 1989 just hanging out when their bass player decided to quit. They talked about options and their singer at the time said “I can play bass, but I can’t sing at the same time”. Then one of the guitar players said “Shawn, you want to sing?” My initial response was nervous laughter but they insisted I give it a shot. I knew all the songs anyway and I used to sing along to the radio and all so they convinced me to try it. So I sang the song and when it was over they looked at each other for a minute and said “So, you want the gig, then?” That was it. Once I joined that band, the desire took over. That band lasted only a few more rehearsals, but one of the guitarists and I joined another band quickly and started writing and playing shows. You’ve been in other bands before, tell us a little bit about them, how you met and eventually decided to form Line Of Fire. Shawn: The first real band I was in as far as recording and playing live was a band called Oracle. We were sort of a hybrid heavy metal and thrash metal. We played shows for a couple of years and made one four-song demo in 1990 and an independent CD in 1992. Then I was out. I’ve been a part of a couple of other metal bands like Trampled Underfoot and K-Octave prior to LOF forming. Both released CDs with me singing and played a handful of shows, but nothing major ever happened. Nikki: I have been playing in bands since 1983. They were all basically amateur “stepping stones” that led to the formation of Dimage in 1990. The sound and style of Dimage has certainly melded with LOF. Shawn and I met around 1996 when he briefly sang with me and two other members of the former Dimage band. Around 2003, Shawn was in a band with Ed Darst and one meeting between the three of us basically led to the formation of LOF. A Journey track inspired your band name. Why “Line Of Fire”? Nikki: The Journey influence is undeniable so.....Shawn suggested LOF. It just made more sense than some other Journey song or album title. “Escape” and “Frontiers” sound like Journey tribute bands. LOF is a more obscure Journey song, so it is a better fit for a band that is influenced by Journey but is NOT a tribute act. Shawn: Because it sounds cool! Ha! Let’s face it, Journey has had an immeasurable impact on the melodic rock scene. The leading label in the scene is called Frontiers, for goodness sake! Then there’s Escape Music, a band called Departure…not to mention all the Journey tribute acts in the internet. It goes on and on. Seriously, we just wanted a name we thought sounded cool and would tie us into the scene without too much thought. ‘Line Of Fire’ just has a cool ring to it. Your self-titled debut album was released back in 2005. Were you surprised by its reception and how did it make you feel? Nikki: I must admit I was surprised by the response it got. It was a great feeling to be so well received by a loyal AOR market, especially the fans overseas. Shawn: I was shocked, honestly. I mean, I was happy with the record and I was proud of the record. But suddenly all these other people started telling us how much they liked it. The reviews were by and large very positive. Then people like Bill Leverty and Vic Rivera and Jeff Scott Soto had nice things to say about us. I was just very pleasantly surprised and very happy that so many had taken to the album the way they did. I get emails still from people telling me how much they like it, what their favourite songs are and why, what the songs mean to them. It’s so humbling and such an honour to have the fans and press alike show us that kind of love. It’s great! The line up has changed since your first album, how have the changes affected the band as a whole? Nikki: We are really proud of the first album and thankful to Matt (Rudzinski) for re-releasing it on Divebomb. My former co-guitarist, Ed (Darst) is a great musician and engineer as well. Shawn: We had arrived at a crossroads with Nikki and I wanting to go one way and Ed wanting to go another. So, we decided it would be best if we all went where we wanted to go and LOF carried on without Ed. It wasn’t an easy decision to make. Nikki: When we parted ways, we were fortunate to find Thomas Clark, who is a great guitarist and engineer in his own right. Their playing styles are slightly different which I think made Momentum more than just a repeat of the first album. Shawn: Ultimately, it has made us stronger. It was a hard blow to take at first, having to make that decision. We went from having a plan and a goal to having no idea what we were going to do. But in the end we persevered and ended up with what we think is a really good album, so we certainly cannot complain. Make no mistake, part of why this album is what it is has to do with the writing and playing of Ed Darst. You can see his name in the credits and his contributions writing-wise cannot be understated. The internet is a powerful medium, do you feel that sites such as “MySpace” play a key role in getting your music ‘out there and heard’? How do you choose who to befriend on these sites? Nikki: It certainly is. I have often wondered how successful Dimage could have been if the internet and digital technology had existed back then. It is certainly beneficial to LOF as so many of our fans are overseas. The goal for a band using social websites is of course, to accept, inform and show appreciation to the “true” fans that support our music. The social networking has certainly exploded and so you must be productive when utilizing it and focus on your fans. Shawn: Oh, the internet has been HUGE for us! MySpace alone, beginning in 2003 I think when I was posting demos of the first few songs, it’s been amazing. Our first fans sprang from MySpace and MelodicRock.com. Add in Facebook and Reverbnation, all the online radio stations and webzines and it’s meant the world to us! Not to mention the message boards, message boards are crucial to a band. It’s where the fans talk about what they love and hate and why they love or hate it. The message board fans have been amazingly supportive. They’re not scared to tell you if they don’t like something, and I’ve seen some honest feedback in this area. But overall, people seem to love what we’re doing and they tell their friends and that’s lifeblood to a band like ours. It’s all about word of mouth and I can’t say enough about our online fans’ support. We would not be here without them. A series of webisodes were made available in the lead up to the release of your second album. A genius move and very innovative, discussing where you’ve been, various details about the album, its production etc. What kind of feedback have you received? Shawn: We got a lot of really good feedback on those. I think the fans appreciated us filling in the blanks on the last five years. We didn’t want anyone thinking we had abandoned them or been wasting our time. I got emails all the time wondering where our new album was and I started feeling guilty almost having to tell people “we’re working on it” all the time. The webisodes were Matt’s idea (Matt is our label head). We thought it was a great idea and were more than happy to do it. The fans got to hear straight from our own mouths how things went down and I think they appreciated that as much as we appreciate them. It’s been a very difficult and trying five years with health scares, change in line up and re-tracking. Many people would have been discouraged by all these set backs, it seems to have made you, individually and as a band, a whole lot stronger and more determined than ever to pursue your dream. How have these events influenced you and do you look at life differently now? Nikki: Well, I have “lived and breathed” music for as long as I can remember so even though there were some roadblocks, there was never any consideration to NOT finishing Momentum. On a personal level, Shawn and I both were deeply affected and perhaps forever altered as human beings during the recording of this album. Shawn’s wife became very ill within a few weeks of my cancer treatments starting. 2007 was a year neither of us will ever forget and I think Momentum is a testament to the spirit of music, perseverance and of survival. Shawn: I know that, for me, I appreciate my wife much more now than I think I did before she got sick. My world is pretty small. Outside of LOF, there’s my wife, my son, and a very small circle of friends. When that world got shaken by her sudden illness, it threw me for a loop. The album is the album. Things like re-tracking, scheduling setbacks, etc seem so miniscule now in light of what happened to my wife and to Nikki and his family by extension. I learned what was important. Musically, I think it’s made me and Nikki even more appreciative of what we do. We are part of a very fortunate, but very small, group of musicians who are afforded the opportunity to record our music and have it out there for people to hear. We don’t look at that as a right, but as a privilege. So many musicians never get the opportunities that we have been blessed with and we try to not forget that. We love making music together and we love our fans. We want to continue making LOF music for as long as people want to hear it. I’m always curious how a track comes together from the bare bones to the fully clothed production! What inspires you and how do you ‘write’? Do moving scenes such as the rescue of the Chilean miners influence you, do you find inspiration closer to home or do you let your imagination run wild? Nikki: Well, Shawn is more of a deep spiritual writer than I am. I myself pretty much always write about life and love. My writing is very personal, although Shawn developed a more personal style on Momentum than the spiritual type lyrics he wrote for the debut album. Shawn: My inspiration comes from a place much closer to home, these days. Most of the lyrics I wrote on Momentum were mainly inspired by my love for my wife; “The Fire Never Dies” and “I Belong” specifically. I wrote those directly out of my love for, and admiration of, her. On the first record, “Faith In Fire” and “Live & Let Go” were more of the “follow your dreams/don’t give up” kind of thing. Nikki and I decided early on that we don’t want to bring anybody down. There’s enough out there bringing people down. It may sound cheesy or clichÈ, but love in all its forms, be it lost love, new love, established love, love of life, love of dreams, etc, this is what inspires LOF. The tracks are written by you both and former band member Ed Darst. You’ve also included three tracks (“It Takes Time”, “Obsession” and “I’ll Be The One Tonight”) originally recorded by Dimage back in the early 90’s whose album ‘It Takes Time’ was finally released in 2008 (check it out Readers!). How did you decide which tracks to record and also why re-record the Dimage tracks? Nikki: The first LOF was not a far cry from being a Nikki Dimage solo album from a writing standpoint. I wrote / co-wrote nine of the ten songs on it. Shawn and I both encouraged Ed to contribute more creatively to Momentum, so it would be more versatile than the debut. The Dimage songs of mine were supposed to be released on Momentum before there was any thought of releasing the Dimage tracks. The various setbacks caused a huge unexpected delay in the recording of Momentum. In the summer of 2008, Matt approached me with the idea of releasing the Dimage sessions from the early 90s. Even before there was a LOF, Shawn used to comment on how strong those three Dimage songs were, so he was supportive in putting his vocals on them and bringing them into the LOF sessions. Shawn: I loved the Dimage stuff and thought it was a very natural thing to use these songs since Nikki wrote them and now he would finally have a way to get a proper recording of them. They fit the LOF vibe perfectly. There was no reason to not do them. Do you have a favourite track and if so why? Was there one that proved to be particularly difficult to record? Nikki: If I had to pick one, I would say “Ghost In Your Heart”. It is the ONLY song that I wrote by myself during the Momentum session. I wrote it for my wife Terra so it is very personal and heartfelt. “Obsession” was difficult for me because I must have done a dozen takes on the solo before I got it like I wanted it. I did not play the solo on the original Dimage version and so it was difficult to play a new one without copying the one that I had been hearing for nearly twenty years! Shawn: My favourite track to record was “I’ll Be The One Tonight”! I’ve loved that song for years and I remember telling Nikki back when the first album came out that it was definitely going on the second album! I just love the melody and the vibe and the vocal harmonies. I am so proud of Nikki for writing that song and I was very happy to be able to record it. The hardest track for me to record was “It Takes Time”. From the harmonies to that high note at the end, that song took the most out of me, I think, in terms of time and effort. Not to mention that I had the ghost of Dimage hanging over me because I love Scott Board’s (the original Dimage singer) voice and wanted to make him proud as well as Nikki. “Obsession” is earmarked by many as the ‘stand out’ track of the album. Any plans for the release of a video? Shawn: We have talked about shooting a video, but we haven’t managed to get it on the schedule as of yet. Matt at Tribunal wants to do it, we want to do it, we just need to work out the details. Track seven, “I’m Crying For You” is quite a departure from your usual sound. This is such a jazzy, swingy number with a rocky edge, a brave choice in many ways. How did this track make it onto the album? Nikki: Fate, I suppose. Ironically, THAT song led to the formation of the band. Shawn and Ed were recording an album around 2002-2003. The music was nothing like LOF but Shawn played “Cryin” for me one night and I said: “Why aren’t you guys doing this stuff”?! “It sounds like Journey meets Toto”! It is a bit different from other LOF tracks but it’s one of those songs that give Momentum more diversity than the debut album. The CD version of your album includes a bonus acoustic track, a stripped back slowed down, haunting and poignant rendition of Dokken’s “Breaking The Chains”. Why this particular track? What’s the reaction been like? Nikki: The idea behind that song came from a cover band I was in back around 2003. We did a short acoustic set and I just kind of stumbled across playing it that way. Shawn thought it was unusual and would be another “curve ball” on Momentum. That’s what most people say about it. Unusual rendition but really cool! How do you feel the new album differs from your debut? Nikki: It of course, sounds like a band clichÈ, but I think it shows our growth as a band. I still stand behind the first albums songs, but we have all learned a lot about the recording process and modern techniques that give Momentum a bigger, cleaner more professional sound than the debut. Shawn: I think the new album is more melodic. The first album had some heavier moments that we don’t really have on this album. Songs like “Faith In Fire” and “Falling Down” from the debut are heavier than anything on this album. We went for the melody this time. We wanted a classic, more timeless sound than an overdriven, hard rock sound. We tried to make the record sound warmer and more in line with the pre-hair band era of melodic rock. We also tried to inject even a little more variety from song to song, yet still have it retain a core sound. I feel like we did what we set out to do. You’re very pleased with the artwork on the CD sleeve and its positive imaging, where did the idea spring from? The official photos on the album sleeve show three sombre men in black. Why so serious when your music is a mix of, to quote you Shawn, “faith, hope and love”? Shawn: We decided to call the album Momentum way before all the setbacks happened. I had this picture in my head of a man running as fast as he could with flame trails behind him and calling it Momentum. Ultimately, what Chris Harris did looks nothing like that, really, but I love the way it came out. It’s got a strong visual vibe and gives off, as you said, a very positive image; people pushing forward, gaining momentum, and shooting off into the stars to follow their dreams. At least, that’s what I take from it. We did not even think at the time about the photos looking contrary to the sound of the music. I honestly don’t think it does, but I can see why someone would think that. Maybe when we take pictures for the third album we’ll all smile and be holding puppies or something. Ha! Nikki: It is kind of an oxymoron isn’t it?! I think it’s another sign of our diverse influences. Even though our lyrics are positive and even light hearted at times, we are very serious about our music. Dokken has always been that kind of band in my opinion. We certainly enjoy ourselves but we are not a “party” band. I guess the intense demeanour and wearing black is our “metal side” creeping through! Melodic, but very intense. Are you planning on touring in the near future? You’ve mentioned before the logistical difficulties, if a full blown tour is not possible would you consider playing at rock festivals in the U.S and Overseas? Nikki: The most painful question of the day! I love touring myself but there are a lot of factors that have prevented LOF from touring so far. I cannot foresee a full blown tour in the works but we have discussed the possibility of playing some festivals in the future and Shawn and I both have discussed doing a live album one day. Shawn: I would love, love, love to be able to play some festivals and other select dates with LOF. Logistics are an issue in terms of rehearsals with Thomas being over an hour away from Nikki and I. Then you factor in family life, jobs, other non-music responsibilities and it just makes it very difficult to plan out. I’m not saying it won’t happen, it’s just going to take some creative thinking on my and Nikki’s part to make it happen. How does it feel to be North Carolina’s best kept secret? Nikki: Well there are pros and cons to that. The truth is I think less people in our own state know about us than in Europe. That’s why we love our European fans. LOF may not have a huge following but the fans that we do have are genuinely supportive of the band. Finally… what would you like to say to the Readers of Fireworks? Nikki: I would like to begin by saying “thank you”! To you Joyce, my friend, and to everyone at Fireworks who has been so kind and supportive of this band since the release of our debut album five years ago. I hope that the readers of Fireworks will now understand why it took so long to release our second album. Thanks to this very thorough and much appreciated interview, I believe that they will. Shawn: I cannot say “Thank You” enough!! Thank you for taking the time to listen to our music, write to us, and continue to show us love and support! We hope to see you soon! A huge “thank you” to you both, it’s been a real pleasure. Everyone here at Fireworks and I’m sure the readers too wish you, the band and your families the very best for the future. That about raps up this exchange folks. Not only are these boys good, they’re out of this world and that’s where the soaring guitars and vocals take you. I’m already waiting in line for album No.3! Why not head over to their MySpace page http://www.myspace.com/lof where you can hear some of the tracks in full and catch up on their latest news. Drop them a line and mention Fireworks, they’re always happy to hear from fellow rock enthusiasts. WHSMith (use the Store Locator to find your nearest participating store).